Alexa Blackwell is headed to the Institute of Notre Dame, and might become a teacher. Francisco Loayza will enter Mount St. Joseph High School, with the dream of becoming a lawyer. Jade Maddox is registered for the class of 2019 at The Seton Keough High School, and wants a career in medicine, perhaps as a pediatrician. 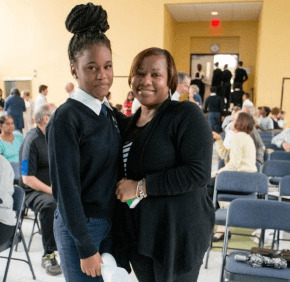 All are eighth-graders at Mother Seton Academy, a tuition-free middle school in Baltimore serving children with academic gifts and economic need. Founded in 1993, it has occupied the former parish school at St. Ann on Greenmount Avenue since 2009. From her president’s office, Sister Margaret “Peggy” Juskelis’ view to the south ranges from the church steeple in the foreground to both the Baltimore skyline and the city penitentiary in the distance. Maddox, whose older sister is graduating from Notre Dame Preparatory School in Towson this month, lives just a few blocks south of where Freddie Gray Jr. was arrested last month. After he suffered fatal injuries in police custody, protests gave way to rioting in West Baltimore. Just like her father, a native of Trinidad and Tobago, Blackwell is a swimmer, but she also wants to learn American Sign Language. Loayza worships with his family, which has roots in Peru, at Sacred Heart of Jesus-Sagrado Corazón de Jesús in Highlandtown. Why does he aspire to be a lawyer? The School Sisters are one of the six religious congregations which support Mother Seton Academy, the others being the Sisters of St. Francis of Philadelphia; the Daughters of Charity; the Sisters, Servants of the Immaculate Heart of Mary; the Xaverian Brothers; and the Marianists. While not all are Catholic, all students are bolstered by a rigorous curriculum. The public speaking preparation done under Marianist Brother Jesse O’Neill was on display in Mother Seton Academy’s speech contest the morning of May 5. Allotted eight minutes apiece, Maddox and four peers performed inspirational oratories, hers about wheelchair accessibility, inspired in part by an older brother with Down syndrome; Internet access; processing grief; wildlife preservation and the high incidence of swimming fatalities among blacks. It was one week to the day after schools in Baltimore City had closed because of the looting and violence that followed the April 27 funeral of Gray.